Atrial Fibrillation: plug it and job done? 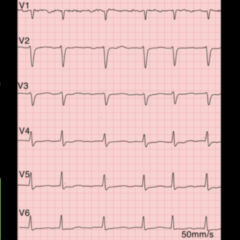 Atrial fibrillation problems are mostly a matter of anticoagulation and ablation. However, there is an alternative: the closure of the atrial auricle with a kind of "stopper". Initial studies offer hope. But an acid test is still pending, for instance a comparison with new blood thinners. Atrial fibrillation (AF) is the most common cardiac arrhythmic disorder. Its present level of prevalence is about one to two percent, write Dr. Nicolas Geis and his co-authors at the University Hospital Heidelberg. Therapy for AF is usually required for well known reason: risk of stroke is significantly increased – compared to patients without AF about fivefold. Annually the risk adds up “to about five percent across all ages”, says Geis. According to estimates almost one third of all strokes are caused by AF. 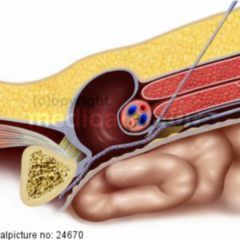 Among these, according to the Heidelberg Cardiologists, about 20 percent of the cerebrovascular thromboembolisms are fatal, while another significant portion leads to “chronic disability”. In addition, employing vitamin K antagonists as anticoagulant is not always optimal. The fact that there is some potential for optimisation is shown in one study that was recently cited by Regensburg cardiologist Professor Dr. Peter Sick at the internists Congress in Wiesbaden. 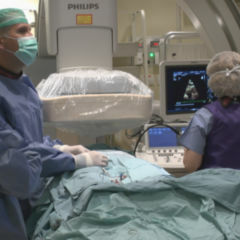 The study involves an analysis of data from 597 patients with known atrial fibrillation who were hospitalised because of a first stroke: only ten percent of the patients under their vitamin K therapy were in the target INR range, 29 percent were under, 29 percent were receiving antiplatelets, two percent even received two different types. 29 percent received no anticoagulant therapy at all. Also, the clinical trials for the new anticoagulant dabigatran, rivaroxaban and apixaban have shown that the posology used with patients using vitamin K antagonists was not always as it should be: the percentage of INR in the normal range (TTR: time to therapeutic range) was on average below 70 percent. It should be noted here, however, that these are averages, and there were, as an evaluation of the dabigatran registration trial has shown, hospitals with better outcome values as well. However, the dosing used is suboptimal for many patients. The situation is “crying out for an alternative”, Peter Sick declared to the Wiesbaden Internists Congress. And: “What could be more appropriate than to plug the left atrial auricula with a ‘peg’ or ‘small screen?” After all, about 90 percent of clots formed with AF occur in the left atrial auricula. 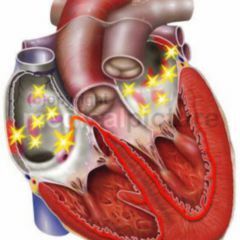 Currently, there are according to Sick two implants with CE approval for such a closure: the Amplatzer Cardiac Plug (ACP) produced by the firm St. Jude Medical, who received the CE mark in 2008, and the “WatchmanDevice” by Boston Scientific (CE Certification 2005). The Amplatzer Cardiac Plug is made of a flexible self-expanding tripartite nitinol mesh. There is relatively little data about this implant, according to Sick. What does exist is a European multicenter observational study involving 204 patients and a bicentric study from Hamburg. Total data available to date covers a period and volume of 1214 patient-months. The data on the effectiveness is quite promising: based on an expected annual stroke rate of 5.6 percent, a reduction of this rate by 65 percent to 1.98 percent (based on 101 patient-years) emerged. The downside is the presence of complications during implantation. More data according to Sick exists on the “Watchman Device”. Data available for analysis here covers 1,500 patient years. This implant consists of a self-expanding nitinol based fabric as well. The single most important study on this implant is the 2009 study “PROTECT AF” published in Lancet. This is a prospective randomised study in which minimally invasive therapy was compared with a vitamin K antagonist therapy. In the study covering an observation period of up to five years, 800 patients were enrolled from 59 centres, 463 patients were assigned to the implant group. The TTR in the control group using warfarin averaged 67 percent. A major finding of the study was that the minimally invasive procedure is not inferior to medication. With regard to the primary effectiveness endpoint occurring as stroke, death or embolism, the rate (derived from a data base of 1,500 patient-years) was 3.0 percent for the implant group; for the control group it was 4.3 percent, which corresponds to a relative reduction of almost 30 percent. Equally high was the risk reduction for all-cause mortality (3.2 versus 4.5 percent). Rate of major bleeding: 1.1 versus 2.1. Current 45-month data from the study shows even now with respect to primary effectiveness endpoint that the implant is not only at least as good, but significantly better than warfarin. Beyond that however, with respect to current safety data warfarin still performs better than does closure of the auricula. Nevertheless, this difference is no longer significant in contrast to previous results. The new data from the study covering 2621 patients-years have just been presented at a conference of the American Heart Rhythm Society in Denver. Stroke: relative risk 0,68 (event rate 1.0 versus 2.4). Here is the current safety data; these results are not statistically significant: primary safety endpoint (pericardial effusion, heavy bleeding, stroke in connection with the operation, hemorrhagic stroke, implant embolisms: relative risk 1.17, ie. an increase of 17 percent to the disadvantage of the implant. This new data could also be of great interest to the FDA, because in March 2010 this U.S. Agency on the basis of security concerns spoke out against the approval and called for further study data. Meanwhile, there are also non-randomised registry data (CAP: continued access trial) available on other patients, who according to the criteria of the PROTECT-AF study received the Watchman Implant. The analysis shows a significant reduction in periprocedural complications alongside increasing experience of the surgeons. 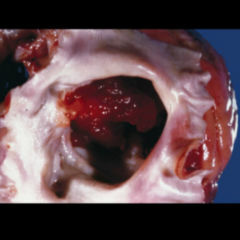 The pericardial incidence requiring treatment amounted to only 2.2 percent. There were no longer any periprocedural strokes occurring at all. Due to FDA request, the so-called PREVAIL study was launched in November 2010. According to study leader Professor David R. Holmes of the Mayo Clinic in Rochester, 407 patients with paroxysmal, persistent or permanent non-valvular AF were randomly divided into either the implant group (n = 269) or the warfarin group (n = 138). Compared to patients in the PROTECT-AF study, these patients were somewhat more unwell, the CHADS2 Score had to be at least 2 (the mean here was 2.6, in the PROTECT AF study it was 2.2). About 20 percent of the operators had to be “novices”, meaning that they were allowed to have had no experience with the procedure (low level of training excluded). In addition, 40 percent of the patients of these “beginners” also had to be treated in hospitals in which staff had had no experience with the procedure until that point. The preliminary, and so far relatively small body of data relating to few patients – 58 patients in the implant, 30 in the control group – show an improved success rate when using the implantation. This amounted in any case to 95.1 percent. In the PROTECT-AF study it was 90.9 percent, in the register study 94.3 percent. Two of the three different primary effectiveness endpoints were met: the rate of vascular complications at 4.4 percent was considerably less compared to the 8.7 percent in the PROTECT study; the stroke rate over the 18-month observation period was an extremely low 0.7 percent. The minimally invasive closure of atrial auriola, says Peter Sick, has “found its way” into “his clinic” already. He also believes that this method will in the future find use in more and more clinics. One matter is still not disputed: more long-term data is missing, as are good analyses on cost-effectiveness. Similarly, the “acid test” is still to come: the comparison with the new anticoagulants. Whether this useful but quite costly data will already exist in the near future is still entirely in question. However, there is already a positive to note: treatment has probably gained options.